Enjoy a relaxing vacation to the Mexican Riviera, Panama Canal or Western Caribbean with Holland America Line! Holland America offers a five-star, premium cruise experience on the West Coast unlike any other. Explore Mexico for 7 nights sailing round trip San Diego. Relax and enjoy the Western Caribbean from Fort Lauderdale. Or cruise between Florida and California through the Panama Canal. 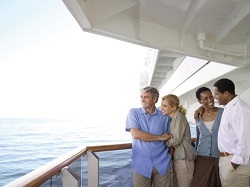 Holland America Line has a wide variety of cruise itineraries to choose from. Every stop down Mexico's west coast presents an opportunity to embark on a new adventure. Experience the thrill of watching Acapulco cliff divers soaring over the sea. The waters off Cabo San Lucas teem with marlin, swordfish, sailfish, and tuna. Puerto Vallarta mixes busy open markets, upscale shops, and cobbled streets. Spend a relaxing evening on deck watching a sunset. Or travel ashore to sample fresh fish and shellfish. Watch the annual migration of the gray whale. Walk down miles of uninterrupted beaches. Explore a sleepy Sierra Madre mining town. On board your medium-sized ship, take salsa lesson or relax on your private verandah. Enjoy amenities tailored to every age and interest, such as a booking lesson or dance class, Holland America Line Mexico cruise vacations are a fit for the whole family. And it's as easy as getting yourself to downtown San Diego... where the pier is just minutes from the airport on beautiful San Diego Bay. 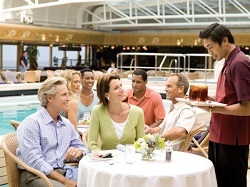 Holland America's professional crew has been academy trained and adapt at the art of remembering guest preferences. Because Holland America sails with a high crew-to-guest ratio, you'll experience service that is truly prompt and attentive. Your stateroom is attended to twice a day; a morning service to clean and refresh linens and towels, as well as an evening turndown service. Complimentary shoe shine service is our pleasure, along with ice delivered to your room. Dining stewards work in teams of two to ensure your experience is perfect, across all five courses. Expect croupiers in the Casino, European-trained spa aestheticians, professional bar staff. Pinnacle and Neptune suite guests enjoy the services of a personal concierge to organize spa, dining and shore arrangements. Canaletto - Spartire is the Italian word for sharing. Canaletto's innovative menu is designed around this authentic Italian experience, offering a variety of dishes to enjoy with family and friends. Share a taste of delicious zuppa di pesce, a tomato saffron broth studded with mussels, scallops and vegetables. Or savor classic Italian pasta in all shapes and sauces. Main dishes include veal, roasted pork loin and grilled fish. And dessert - chocolate tortas, gelato and a trio of tiramisu. Lido - At the top of the ship, the Lido Restaurant offers relaxed dining and panoramic views of the sea. Rise and shine to a variety of tantalizing breakfast selections including pancakes, fresh fruit, eggs and omelets cooked to your liking and more. Lunch offers bountiful choices from around the world - Asian cuisine, pizza, made-to-order bistro selections, gourmet sandwiches and soup, and an extensive salad bar. In the evening, enjoy entrees from both the Lido and the main Dining Room, along with gracious table side service and wine selections from the cellar. Casual attire is always acceptable in the evenings at the Lido. This ground breaking concept blends guests love for food and entertaining into a unique, interactive experience. Explore regional fresh ideas in food and entertaining while you sail. Discover your inner sous chef or how to choose the perfect wine. Feel the spirit of a region come to life on board you Holland America cruise with regionally inspired cooking classes, artisan workshops, local entertainment and more. At the heart of the Culinary Arts Center is an innovative show kitchen outfitted with multiple plasma video screens to capture fine details close up. Join the resident Culinary Arts Center Host for hands-on cooking classes and cooking demonstrations featuring regional recipes. Discover new entertaining tips by attending classes in flower arranging, plate presentation and cake decorating. Special workshops for children and teens focus on fun, easy-to-make recipes. Shake it up with signature cocktail classes and bartending tips from our bar staff, or try new wine and food pairings. On select cruises, some of the world's leading chefs, cooking shows hosts, vintners and cookbook authors conduct classes and contribute to special menus. Throughout your Mexico cruise enjoy a premium onboard experience featuring our Greenhouse Spa & Salon, Culinary Arts Center presented by Food & Wine Magazine, Exploration Cafe powered by The New York Times, Digital Workshop powered by Windows. Feed your curiosity at our Exploration Speaker Series, which features experts on the history of the canal and the art, culture and wildlife of the region. All this, plus our award winning 5-star service and spacious accommodations. 11 Day Mexican Riviera Cruise Special From $899 US! 7 Night Mexico Cruises Roundtrip San Diego From $449 US!